They are still a long way from winning it, but Manchester City's progress to their first Champions League semi-final is not just a giant step forward for the club, it should supply manager Manuel Pellegrini with enormous personal pride. Pellegrini will not admit it, of course. He seemed to enjoy deflecting questions about what Tuesday's win over Paris St-Germain meant to him - and for his future - preferring to talk about the club's prospects instead. The 62-year-old Chilean has done that a lot since City announced to the world at the start of February that he is making way for current Bayern Munich boss Pep Guardiola in the summer, handling any praise or criticism that comes his way with the same quiet dignity. On Tuesday night he was given congratulations by the media for his achievements, which surely deserve more credit given the unique circumstances he finds himself in. His replacement has already been named and has been given the brief of winning Europe's elite club competition, but it is still possible that Pellegrini could win it first - and beat his successor along the way. Win or lose, Tuesday night was always going to be seen as one of the games that will define Pellegrini's time at City, along with the silverware he has collected. Defeat would have ended his final chance of adding to his haul of trophies, which stands at one Premier League title and two League Cups and is viewed by some as a modest showing from three seasons at a club of City's means. An exit would also have increased the volume of those voices that believe the club's faltering form in the Premier League in recent weeks has been down to the announcement Pellegrini is on his way out. Instead, victory keeps alive City's chances of the type of triumph that their wealthy Middle Eastern owners surely envisaged when they bought the club in 2008. And even if he falls short, Pellegrini is already responsible for the sort of landmarks he knows he was expected to reach when he was appointed in 2013. City are now into a European semi-final for the first time since 1971, when they lost to Chelsea in the last four during their defence of the now obsolete Cup Winners' Cup - which remains their only continental trophy to date. 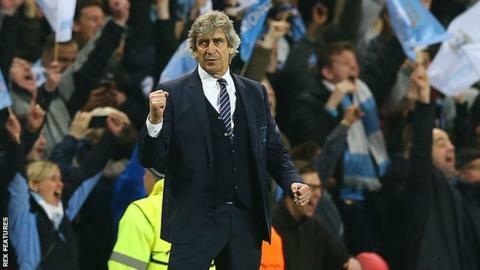 Pellegrini had already taken them out of the Champions League groups for the first time in 2013-14, then helped them win their group for the first time this season and has continued to lead them into uncharted territory in the knockout stages. "I came to City because I had good performances in Europe, so to leave this club without taking them to a new state would have been a bad thing for me," the Chilean conceded after Tuesday's victory. "It is very important to me to be in the semi-finals because that is my job." Given his side scored a record 151 goals in all competitions in his first season in charge and are also known for some chaotic defending, a 1-0 win with one shot on target was an unlikely way to register such a significant European victory. An exciting attack and an occasionally disastrous defence is the way Pellegrini's City sides will be remembered. On Tuesday, however, his team - and some of his signings - showed they are capable of disciplined defence too. Not that it affected his attacking philosophy. Pellegrini said before the game that he would not change his style to protect the advantage City held with the away goals they scored in last week's 2-2 first-leg draw in the French capital. We should not be surprised that it worked. While the Champions League semi-finals are new territory for City, Pellegrini has been there before. It is 10 years since he took Villarreal to the last four, where they narrowly lost to Arsenal after missing a last-gasp penalty that would have forced extra time. He came within seconds of returning in 2013 with Malaga, when it took two stoppage-time goals by Borussia Dortmund to steal victory in their quarter-final. His success and style of play - the Daily Telegraph described it as "death by beautiful geometry" during City's title-winning season of 2013-14 - surely makes him a catch for Europe's leading sides when he leaves Manchester behind. Whatever his long-term future holds, Pellegrini does not want to talk about it yet. "I am not thinking about it. I don't want to link anything that has happened with this win with the future and another job that happens for me," he said. In the short-term, City - and Pellegrini's - chances of winning the Champions League will be clearer once Wednesday's quarter-finals are completed and Friday's draw is made. He would not entertain the thought of City meeting Guardiola's Bayern Munich side - who play Benfica on Wednesday - before the season is out, asking: "This is interesting for who? The media?" Instead, as usual, he was concentrating on his own team. Before those semi-final first legs take place, City play three Premier League games and Pellegrini says his focus is on those to ensure they finish in the top four and are back in Europe's top tournament next season. Could they win it this time though? On the back of their performance against PSG, even Pellegrini dares to dream. "In the semi-finals you know you have to play against a very big team," he said. "But playing the way we did here, we have a lot of chance against anyone."